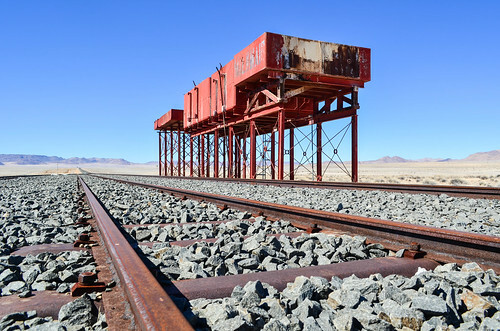 What I like about the Namib desert and the Sperrgebiet is that, since nobody would want to live there for the lifestyle, every man-made structure carries a part of the local industrial history. 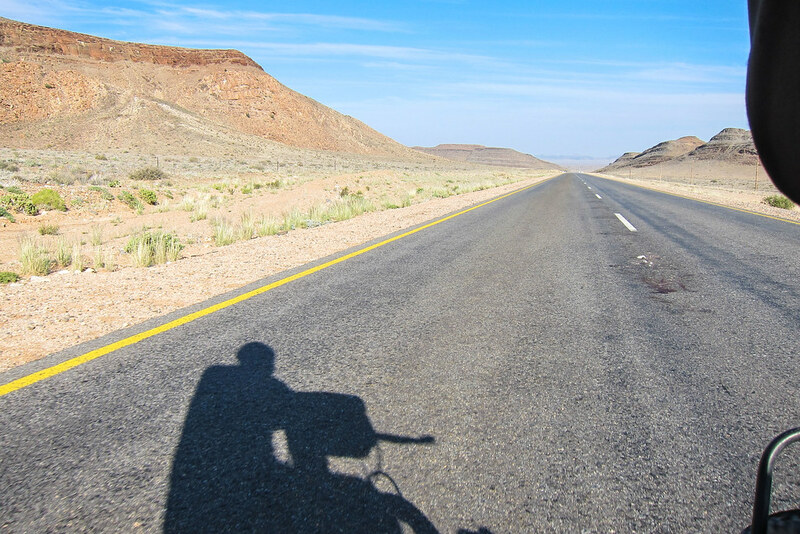 My four days in Lüderitz were very pleasant and I’m now cycling back to Aus, and then South Africa gets really close. 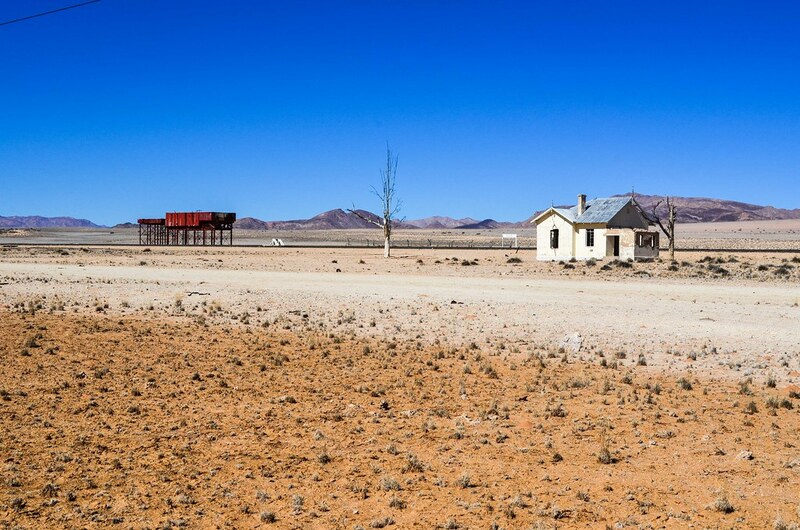 As I leave the Kolmanskop ghost town, the railway under renovation still runs parallel to the B4 road. Just after Kolmanskop, twenty kilometers from the coast, I stop at Grasplatz. 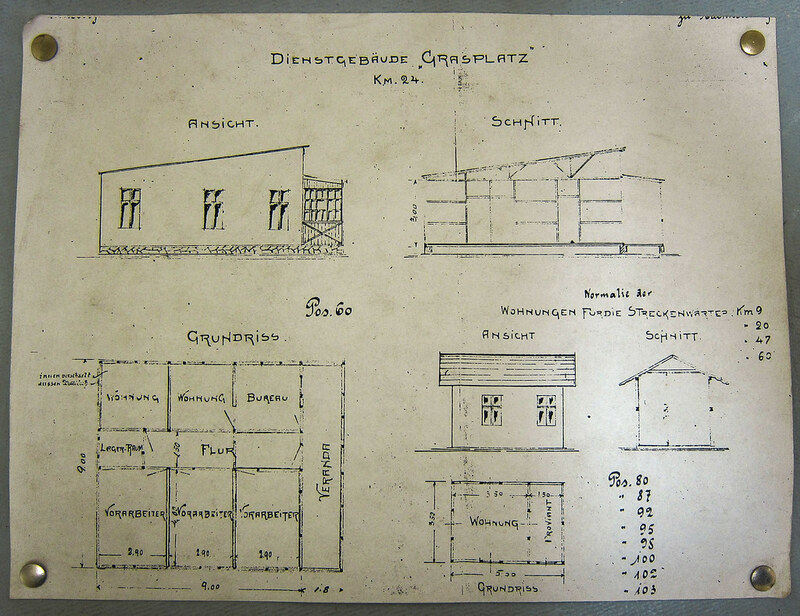 Grasplatz is called like that because the place was used, before the railway was built in 1906, to store the grass for the wagon-pulling oxen. 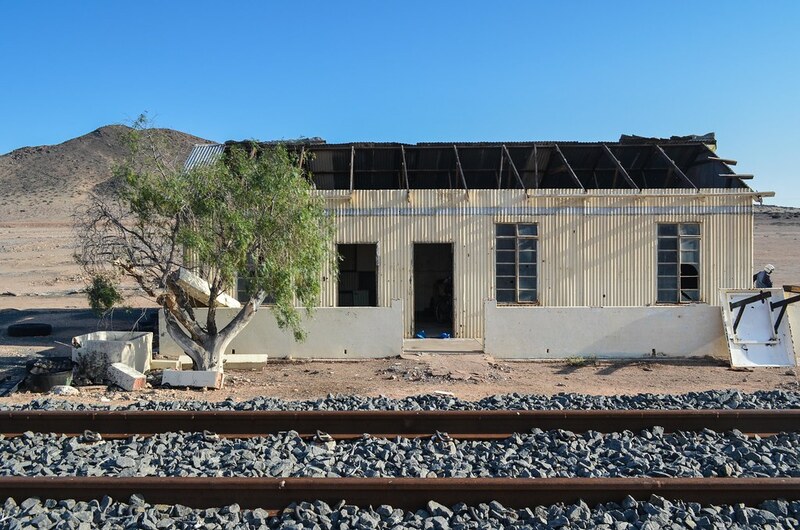 I have seen the plans at the Windhoek railway museum. The Aus-Lüderitz railway was proudly completed in 1906 by the Germans, after only 9 months of work. 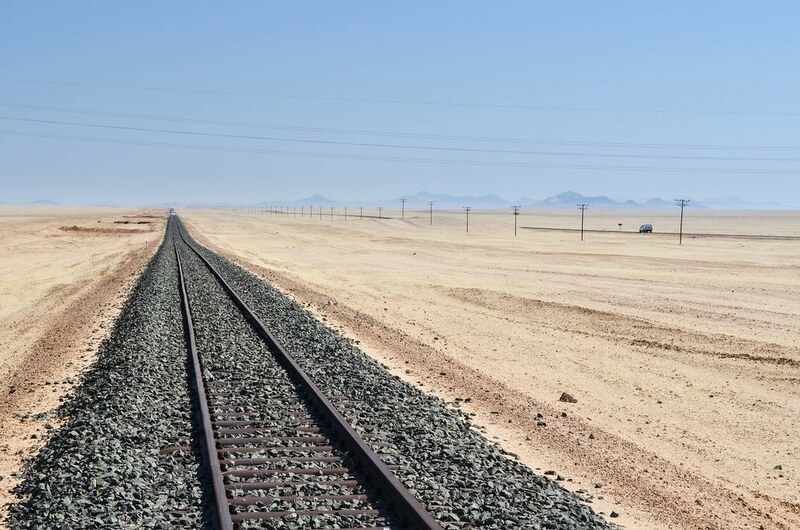 Quoting a very well documented website, “this railway line is built with concentration camp labour from Shark Island near Lüderitz, without recourse to proper nutrition and medical facilities. 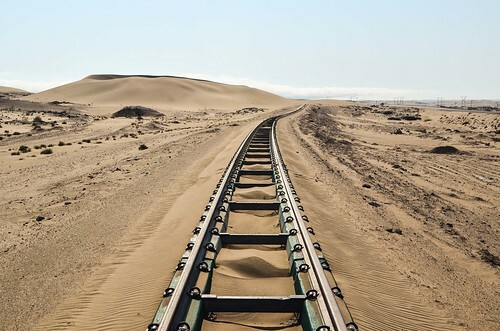 The statistics of the railway project is frightening. 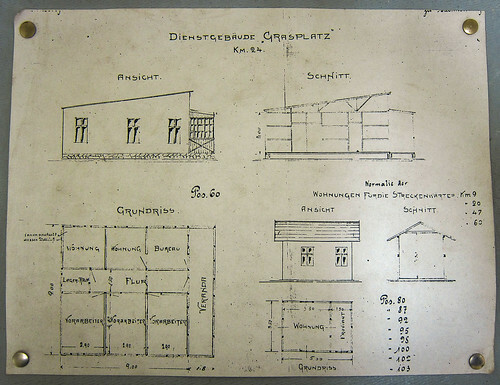 According to numbers kept in the records of the German Colonial Administration, a total of 2 014 concentration camp prisoners were used for the railway construction between January 1906 and June 1907. 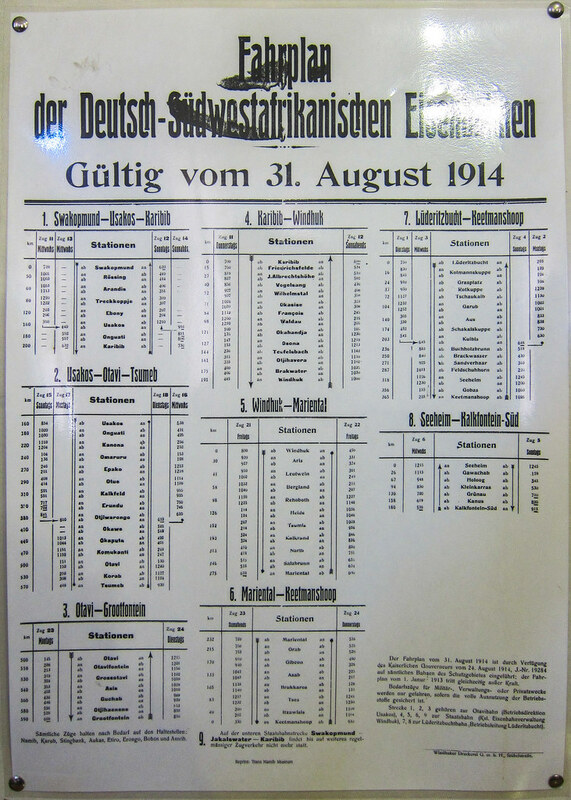 From these prisoners 1 359 died while working on the line: a 67% mortality rate. 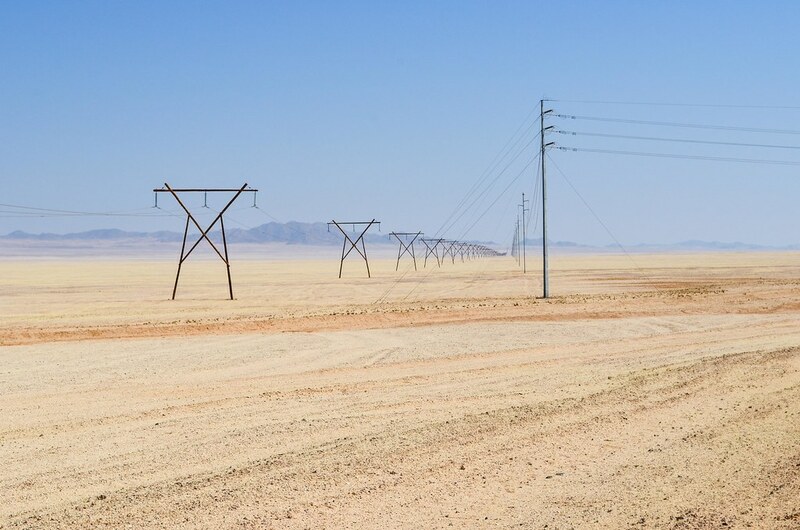 This means that every hundred metres of the railway line from Lüderitz to Aus account for one dead Namibian Shark Island prisoner“. Pictures of the reconstruction in 2002-2004 are here, and most of the rail I see is from these years. Ian had also told me that around the road are old forts built by the Germans. So, I decided to walk to any suspicious structure I would spot from the road. Being in the desert, it’s easy to spot artifacts in the landscape, but it takes time to walk until them. 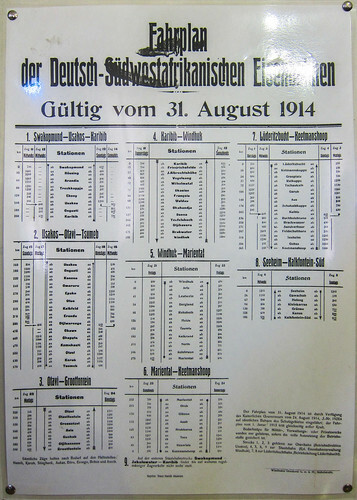 About the German military in this region, I can’t remember if it was for fighting against the local tribes, or during WWI against South Africa. Anyway, from that hill I can still enjoy the views over the Sperrgebiet with more of a bird’s eye. And it’s quite fantastic. I don’t know if this is the bushman’s candle or not. 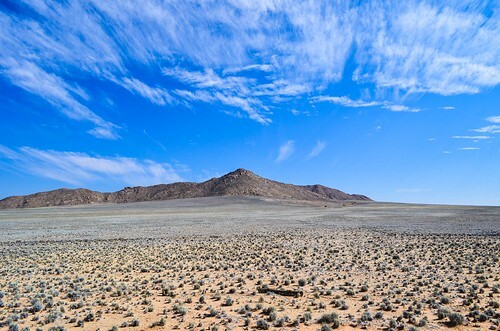 I was told a plant grows around here, called the bushman’s candle, and can be burnt like a candle (but with a specific caveat, like the smoke is toxic or something else). 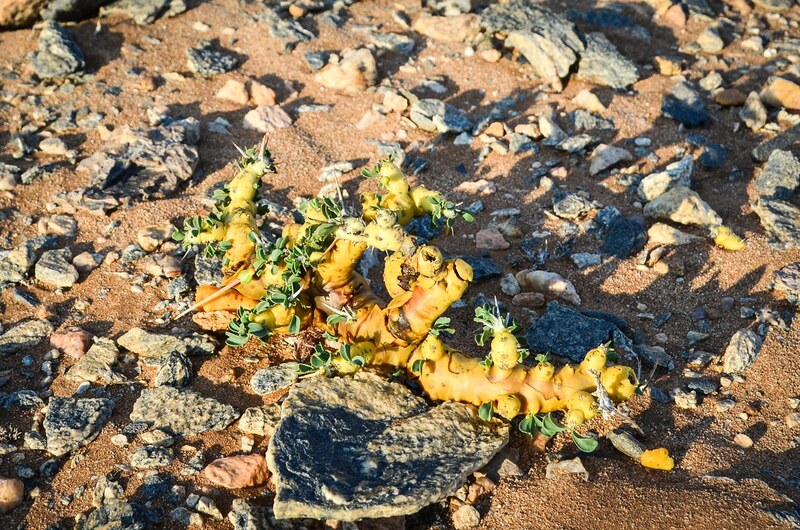 Indeed, the sarcocaulon has “fleshy branches, covered with wax, [which] are flammable and can even when wet be used as a kindling to light fires“, but I’m well equipped enough not to have had to try it. 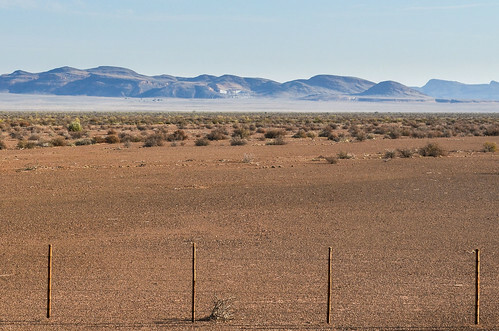 A funny example on how Namibia is so wide and so small at the same time, is the picture above. 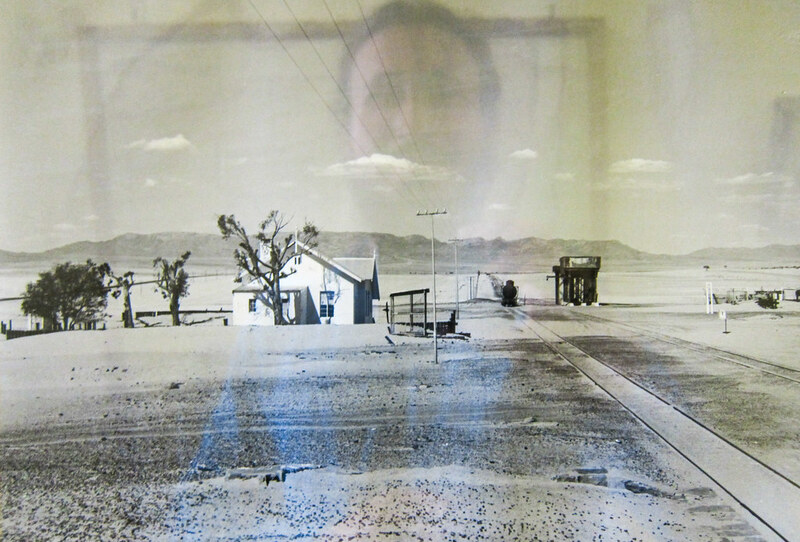 While “posing” with the self-timer, a car passed with an empty trailer; it’s on the far left of the photo. 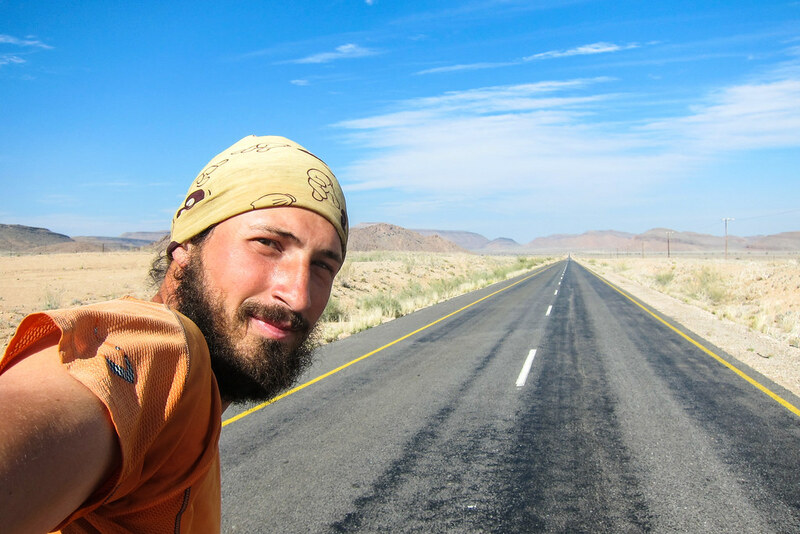 It’s Steve, the mechanic/station manager of Aus, who I probably will see tomorrow, and who traveled to Lüderitz to drop a broken car. I finally reach my planned destination for the night, the ruins of the Haalenberg station. 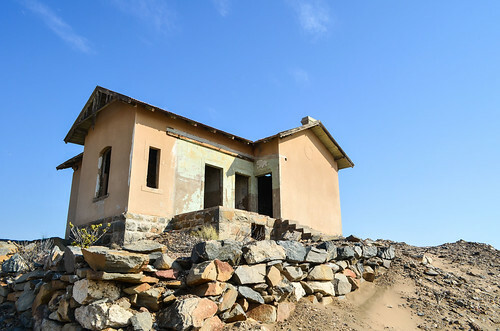 From Lüderitz, the stations of Kolmanskop, Grasplatz, Haalenberg and Garub are the only ones of the Aus-Lüderitz line where a structure remains. Tschaukaip is just a sign. 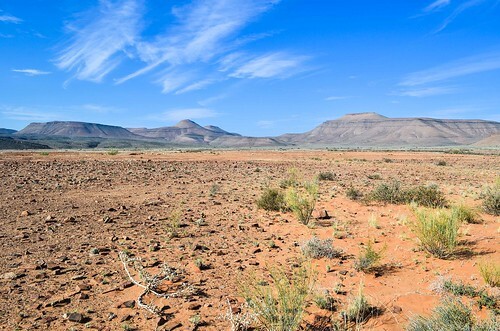 There is no wind, but just in case (there is a “Caution: Hyenas” sign just a kilometer away), I set up my tent inside the ruins: I have 3.5 walls and a roof, it’s not too bad. I chat a bit with the railway workers stationed here, and then kill time by cleaning the inner side of all of my chain links. During the night, I get visited by something. I can’t tell what it was, probably a gemsbok. Haalenberg is the only point over the 120 km of that empty road where hills are so close from the road. In the morning, I climb one of them, still in search of these “German forts”. And indeed, I see man-made structures: not forts, but trenches and heaps of stones. It does look like a defense system. I find a bullet in one of them, but no one can tell me if it’s a German bullet from WW1, earlier, or an amateur hunter from the XXIst century. 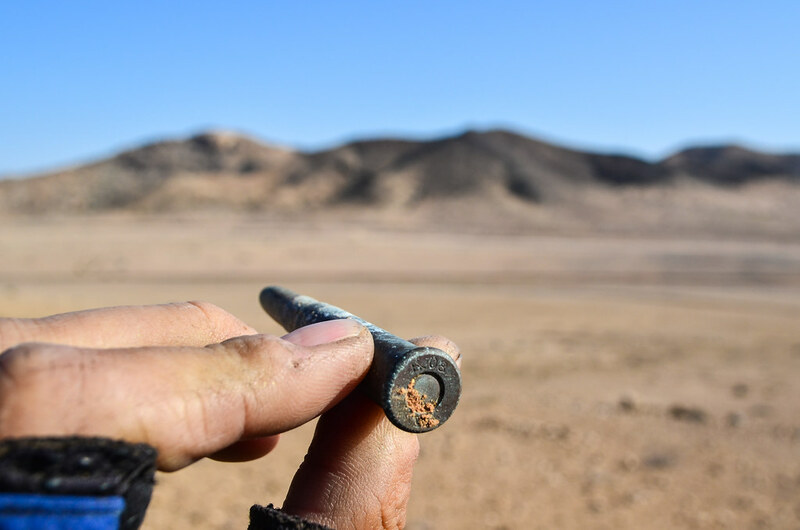 WW1 German bullet in Namibia? Later today, I will give it to Ian, meeting by chance on that same road. The wind is in my back today! 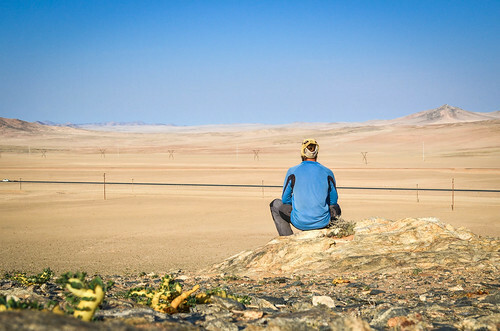 Quite often in Namibia, the morning brings a surprise: after I wake up and walk around my tent, the wind slowly builds up while I eat and pack my gear. 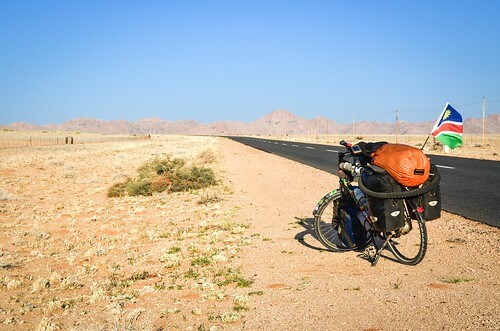 By the time I am on the saddle, I can call it tailwind or headwind, and guess if my day will be a good one or a tough one. Thus, apart from the last 40 km of sandstorm on my way to Lüderitz, I am having a rather lucky 240 km ride in the Sperrgebiet, with tailwind more than half of the time. 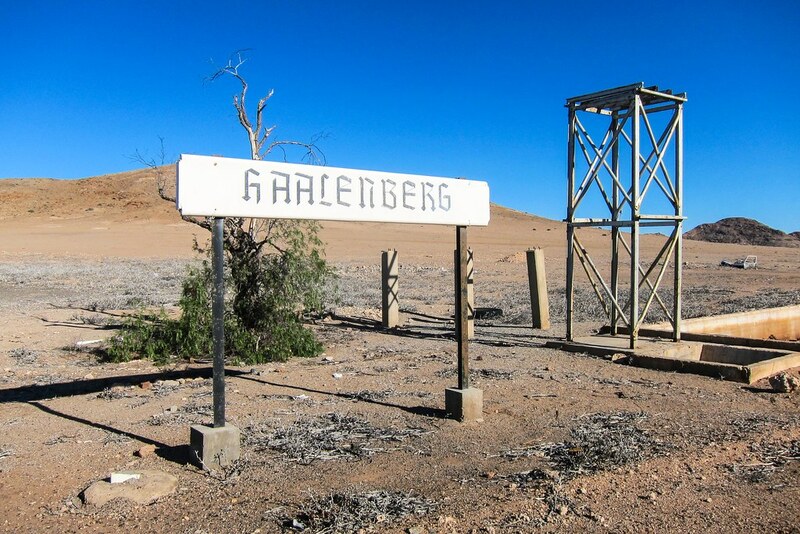 The only shade between Haalenberg and Garub: lunch break! 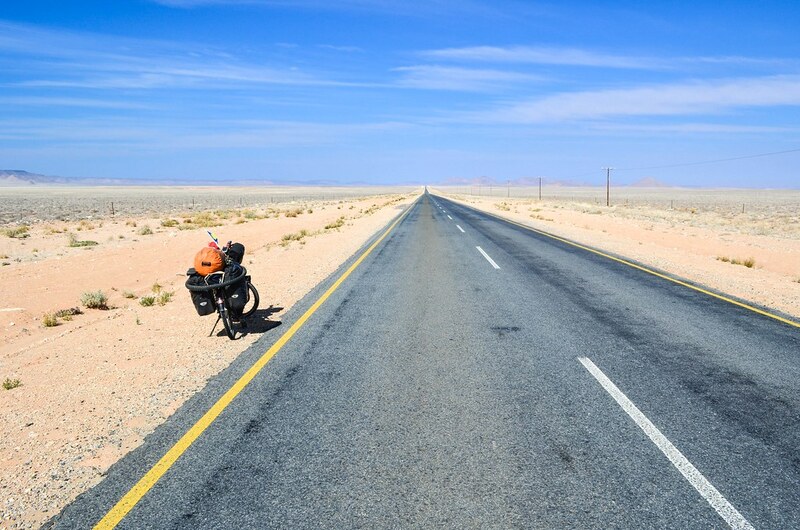 A headwind in such a desolate place would be depressing. 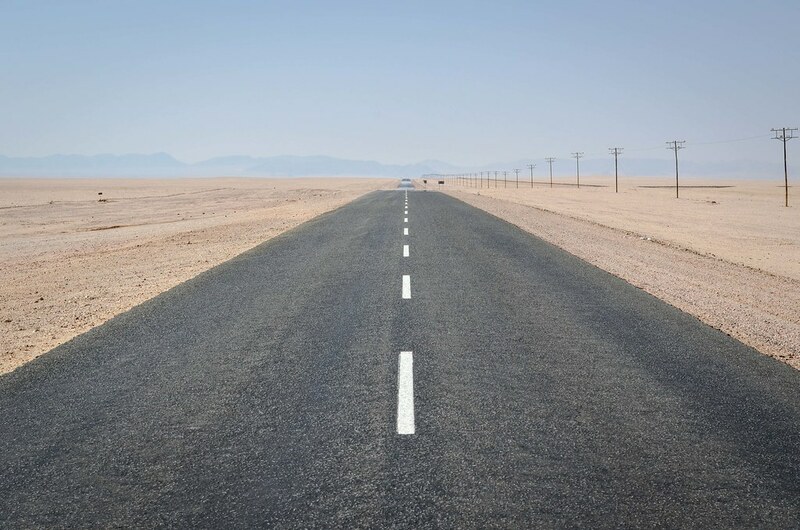 I remember it too well around Tarfaya in Western Sahara and on the Skeleton Coast. 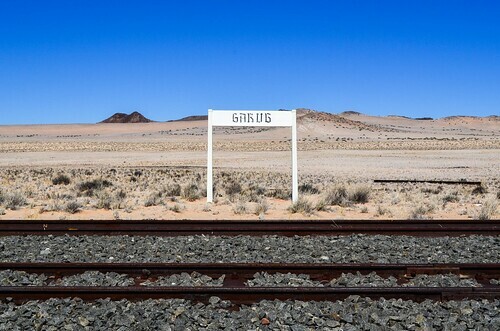 My next train stop is the Garub station. 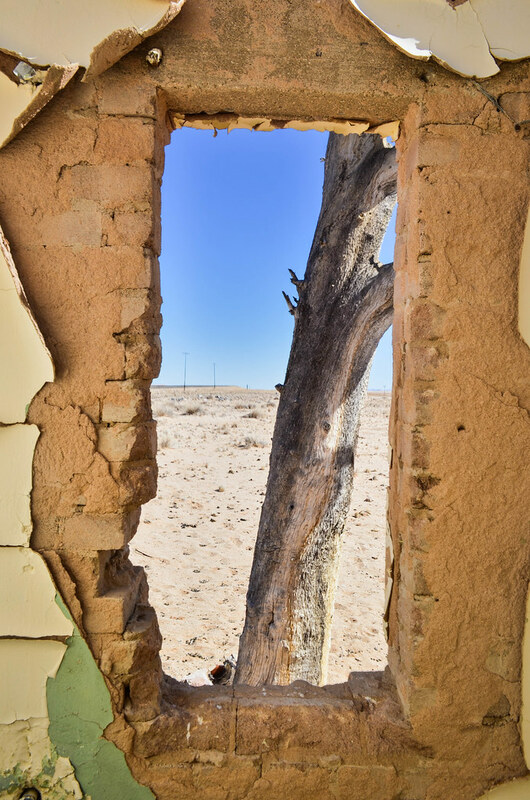 It has a dilapidated building, two dead trees, and rusty elevated water tanks. There is a car parked there, and this is the French couple I met when leaving the backpackers in Lüderitz. People in shorts taking pictures of my bicycle. Yay! Are they going to spoil my photoshoot of the dilapidated station? I don’t think so. People travelling in buses usually have no time, and no personal space. I find it a shame, especially in Namibia, where most of the country is about enjoying the infinite space. It’s a bit on the same vibe as the Japanese golden-week tourism ads for “visiting Europe in 5 days”. 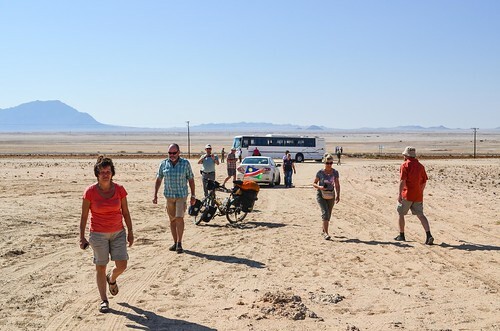 On the other hand, to truly enjoy that wonderful time+space of Namibia, a tourist needs lots of time and a vehicle (often one that costs a lot to rent), so it’s not a cheap destination. (And once again, cycling wins). 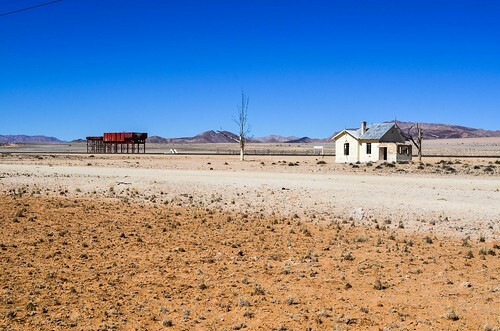 By the time we finish chatting with the two other French, the tour bus is already gone and I am left alone with the sun and the ruins. Nothing has really changed in 100 years. 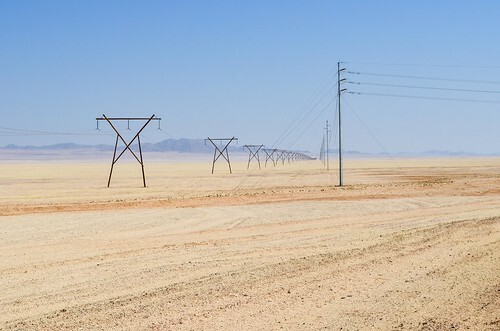 The electric poles and telephone lines have been replaced and upgraded, some trees have died, and color photographs have appeared. And of course, the new rails. It’s time for me to check what’s in those red tanks. The rust has partly chewed the sides and the bottom of them, but not the ladder. These tanks are actually more than rusty tanks. 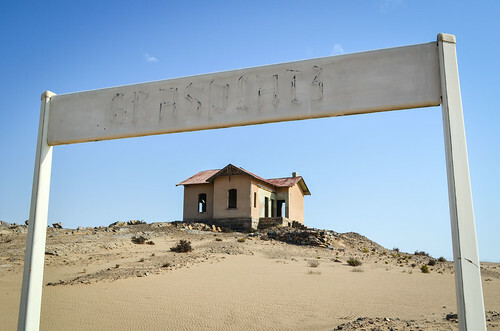 They were feeding Lüderitz with water, and they have made possible the construction of the railway in 1906. At that time, the only drinking water was a source 2 km from Garub train station. A 2.4 km railway was built to transport water from the source until these red tanks, from which it got then distributed until Lüderitz, 100 km away, apparently until 1990. 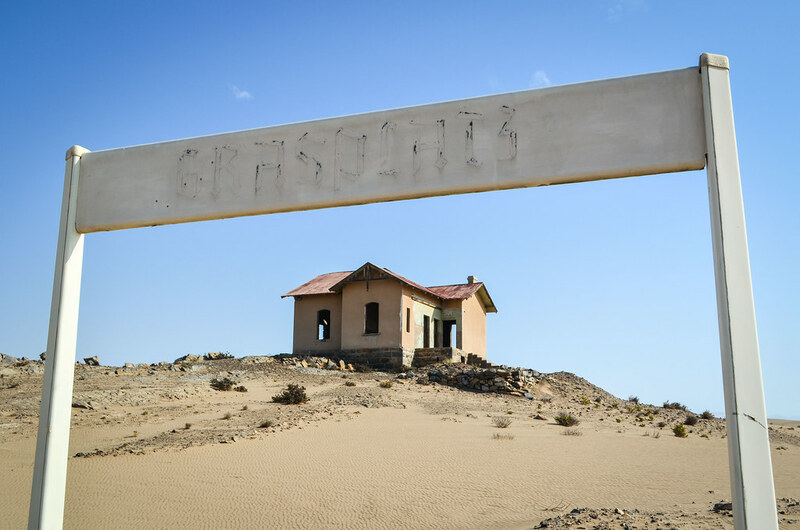 In its early days, Lüderitz received water by ship from Cape Town. 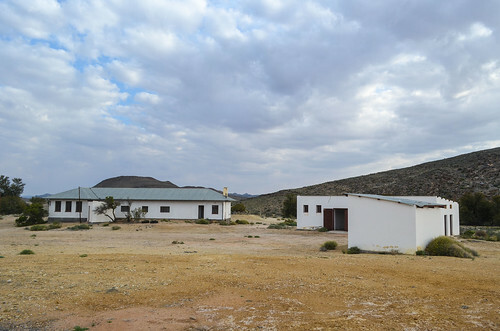 I am not sure if these red tanks were active until 1990, but I have seen a fairly recent pumping station 40 km from Lüderitz. 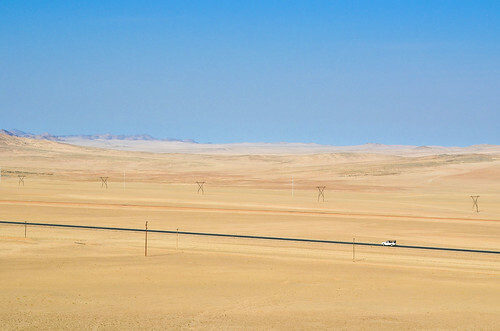 The Namwater website says the 120 km pipeline from the Koichab depression was commissioned in 2002. I didn’t find the rails of this 2.4 km line, that Klaus Dierks shot in 2002 here and there, but we can maybe guess them by looking at the straight lines on the satellite picture. 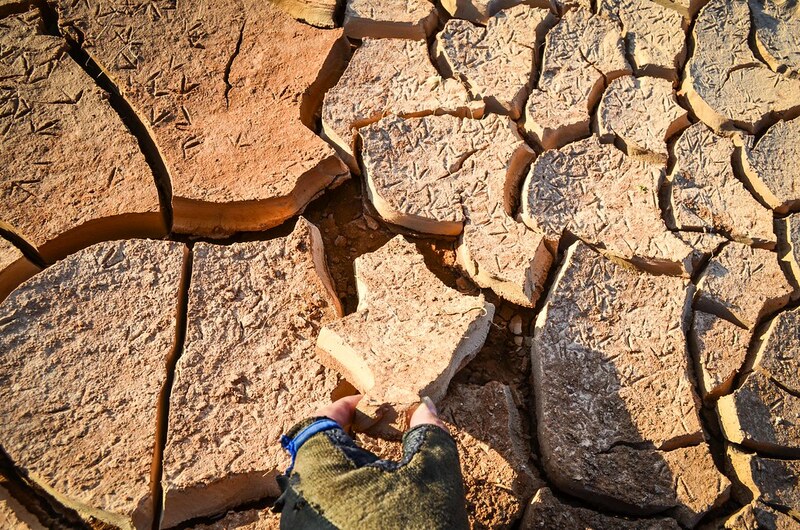 A good point about deserts over rain forests, for historical purposes, is that things don’t change and traces can last for years. That also includes 4×4 driving off road and destroying the landscape for a century. 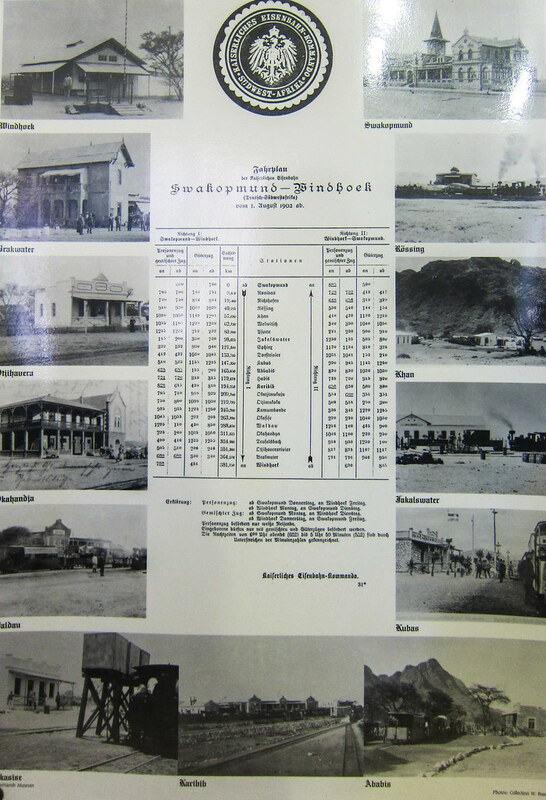 There is something really nice I found at the Windhoek railway museum: the train schedule in 1914. Since the German South West Namibia was not defeated yet by South Africa, it is written in German. 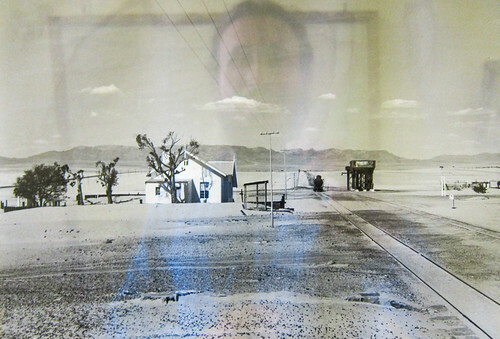 It is worth nothing that, first, trains had a regular service 100 years ago, more frequently and in much remote places than today. And also, most of the stations are today abandoned. My favorite map of the Windhoek Railway Museum is the concept railway between Namibia and the Victoria Falls. At that time, Namibia was SWA, Botswana was Bechuanaland, and Zambia was North-Rhodesia. It was too expensive to build a railway through the desert, and anyway the Germans were quickly defeated in Africa. 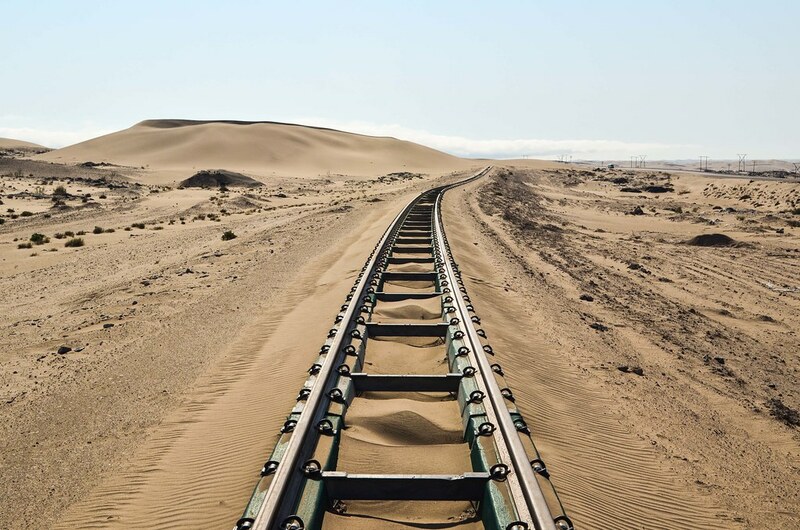 It’s, in a smaller scale, similar to the other over-ambitious rail projects of the colonial empires: France wanting to link Dakar to Djibouti, and the British almost succeeding in building the Cairo to Cape Town railway. It was a hundred years ago. But, there is greater need for these projects at present than ever before. 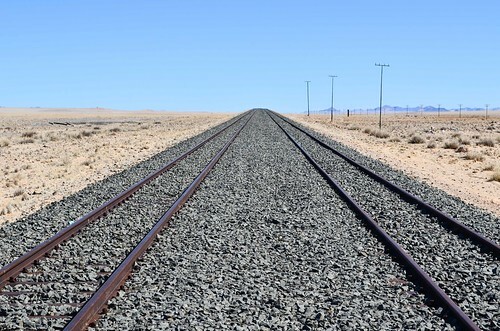 Landlocked Botswana is looking at building a railway through Namibia to export its mining products, freeing them from the dependency on South Africa. 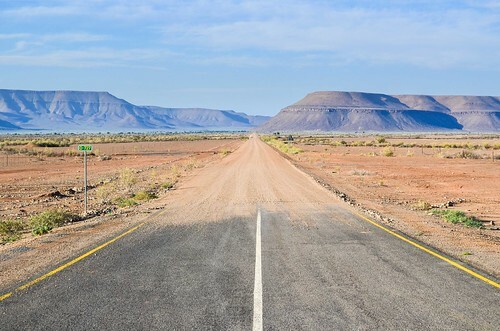 On a continental scale, Trans-African corridors are finally connecting places lacking international cooperation. By the way, the nine highways map illustrates once again how DRC’s jungle is not compatible with travelling. 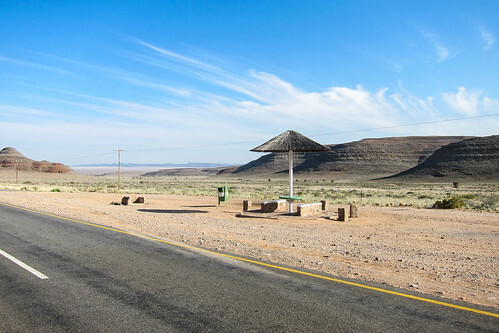 There is a waterhole and a viewpoint in front of the Garub train station. It seems misplaced … a viewpoint in the Sperrgebiet? 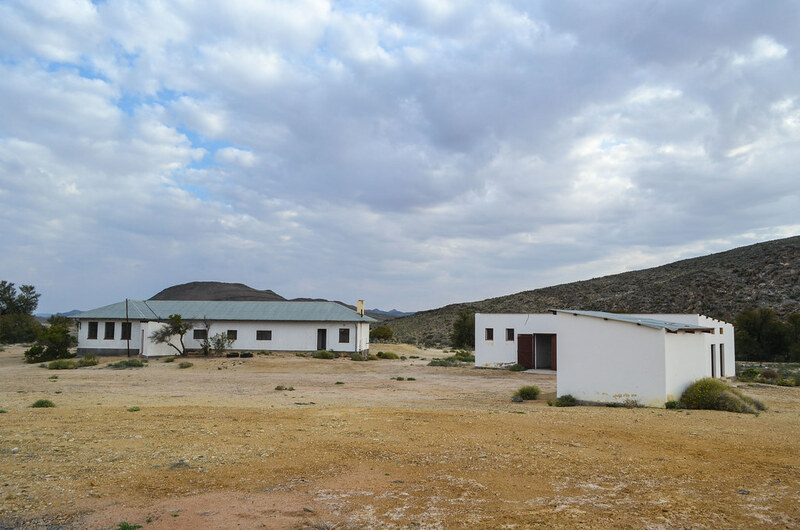 I had passed it on my way to Lüderitz, and will now pay it a visit. The waterhole is supposed to attract the Garub wild horses. 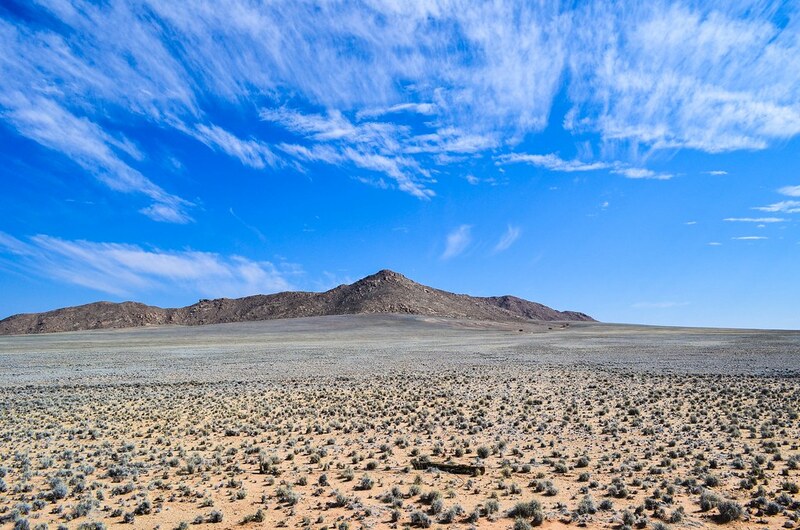 This part of the Namib is home to about 150 feral horses (276 at the 2001 count before a severe drought). Nobody can accurately tell why there are here. One plausible theory relates to the German occupation of South West Africa a large number of horses were needed for the cavalry and an eccentric German nobleman, Baron Hans-Heinrich von Wolf, set up a horse breeding station at his outlandish castle, Duwisib, on the edge of the desert. Once the Baron went off to the first world war in Europe nobody looked after the stable of more than 300 horses and after his death herds of them ran wild, roaming the veld around Duwisib until 1950. 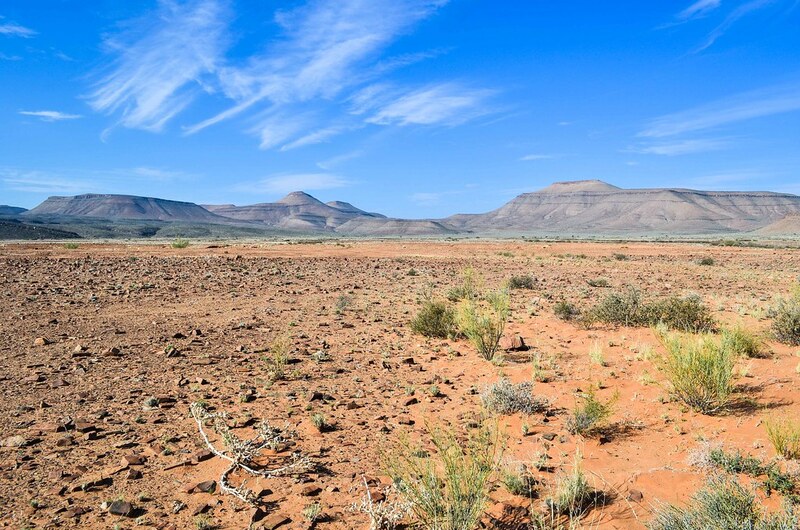 It is possible that some of them wandered the 150 kilometres south- westward to the water at Garub. 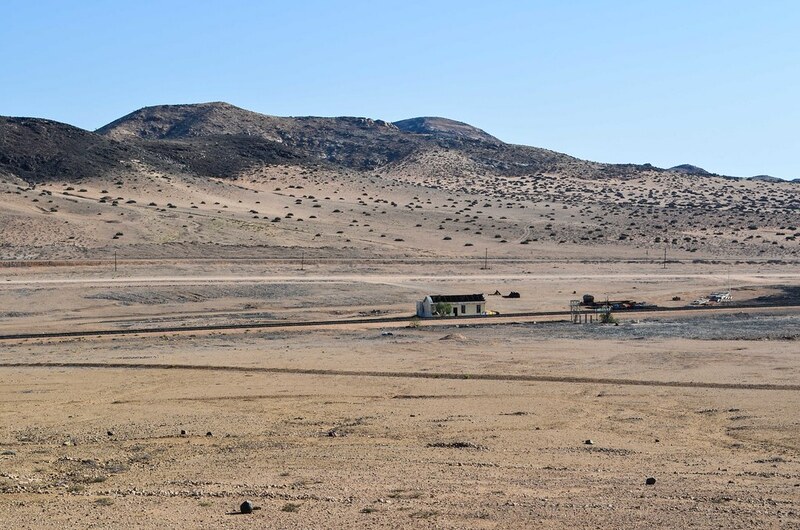 It is likely, too, that some of the feral horses originated from the Schutztruppe mounts, as well as from the those belonging to a South African Expeditionary Force that took control of the Lüderitz- Keetmanshoop line during the First World War. 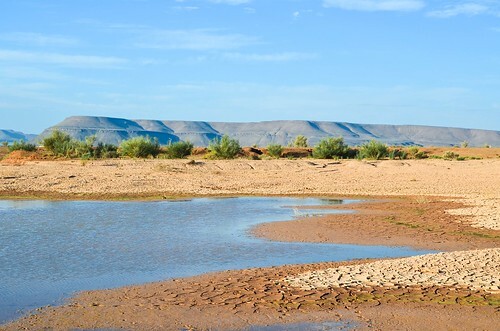 Another theory is that a ship carrying thoroughbreds from Europe to Australia that ran aground near the mouth of the Orange River. 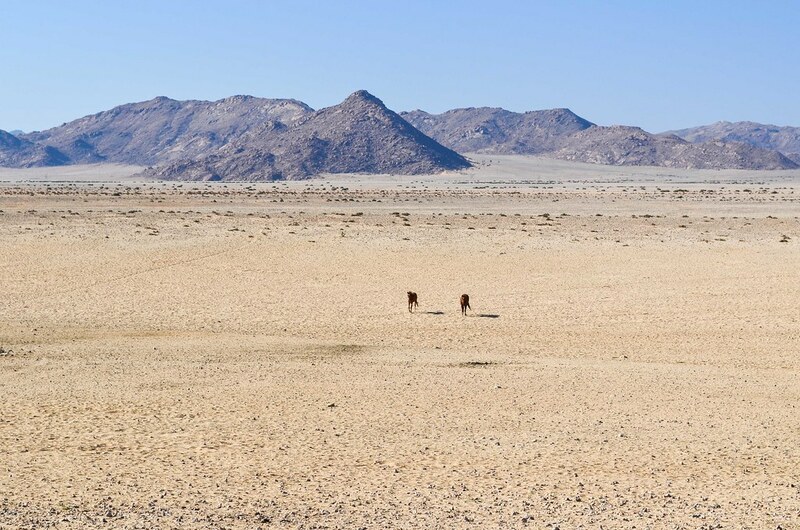 The strongest horses could have reached the shore and found their way to the Garub plains. 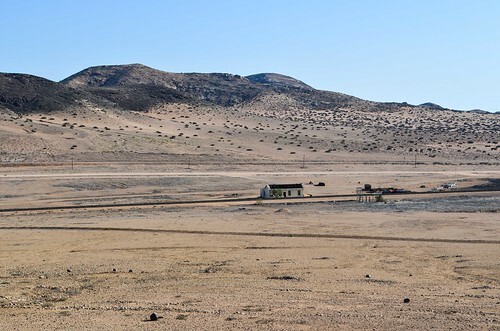 I can’t imagine the last theory being true, since the mouth of the Orange river has perennial freshwater and a lot more grass than the Sperrgebiet. 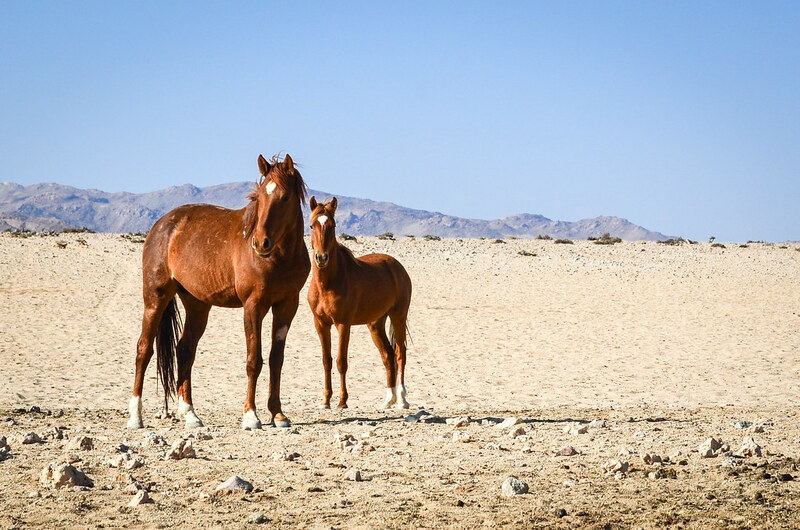 And it’s better for my traveling eyes to meet abandoned German horses. 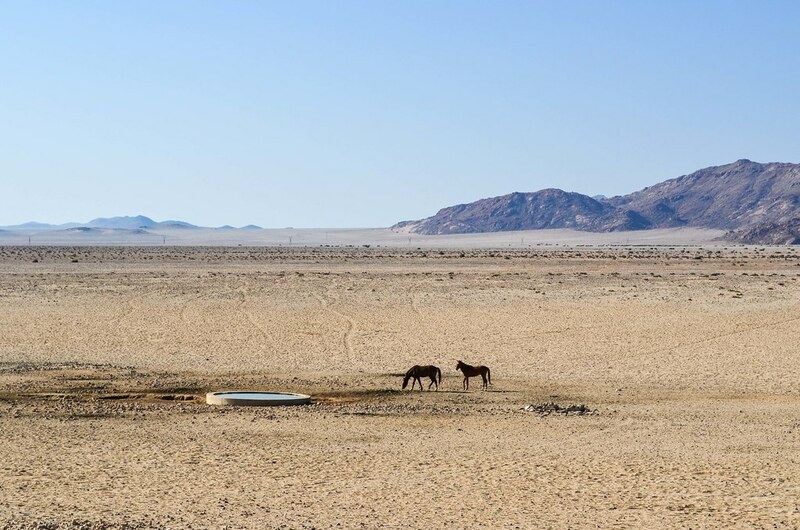 Whichever their origin is, it’s still incredible that tamed horses abandoned into the hostile Namib managed to survive. A few minutes after I show up at the viewpoint, eating something in the shade (yes, shade! ), I am lucky to see two of these wild horses approaching. Their regular paths are clearly visible in the sand. 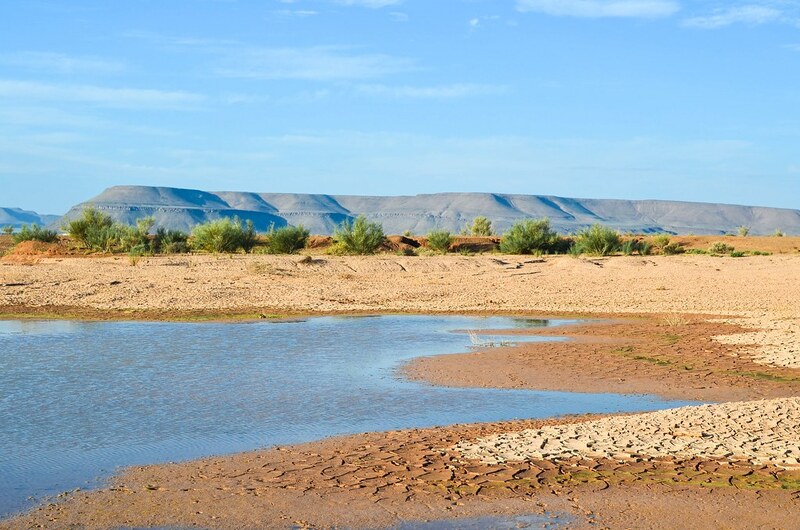 My lack of telephoto lens pushes me to walk down to the waterhole, where they don’t seem as scared by my presence as gemsboks or ostriches would be. The slope up to Aus is tough, and I feel the significant temperature change when I approach 1400. Luckily I still have a bit of a tailwind, and I am confident I will reach Aus before night. And after meeting Ian on the slope, I reach my destination for the day just in time. It’s rare enough that I make a plan to end the day somewhere, and that I manage to make the plan happen even while stopping often. Steve, of the Aus gas station, is still as nice as on my first visit. He gives me a discount for the campsite and lets me buy a beer. 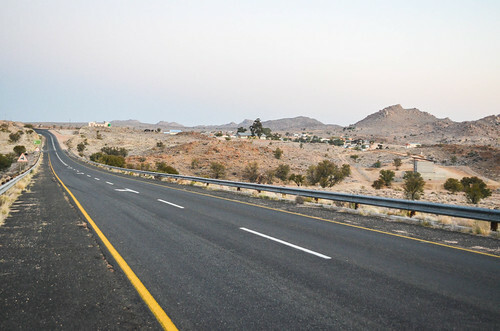 Buying alcohol in Namibia is prohibited from Saturday 1 pm until Monday. While having camp-stove dinner with Israeli tourists, unsure if they should introduce themselves as Italians because of the mediatized ongoing Gaza conflict, I finalize another last minute route plan change. I won’t be taking the road to Keetmanshoop, and then visit the Fish River Canyon, but will instead go south from here to Rosh Pinah, visit a mine where Ian got me a contact, and ride along the Orange river, apparently a great scenic road. 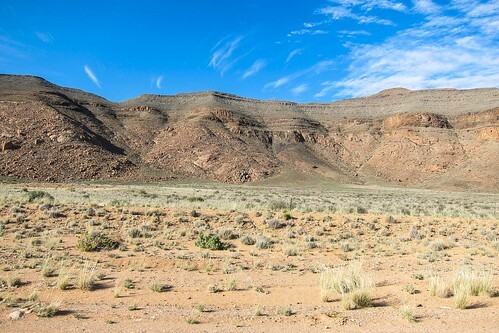 Thus, if I want to see the Fish River Canyon, the largest canyon in Africa, I will have to add a 4-day loop just before crossing to South Africa. I will see how I feel then. 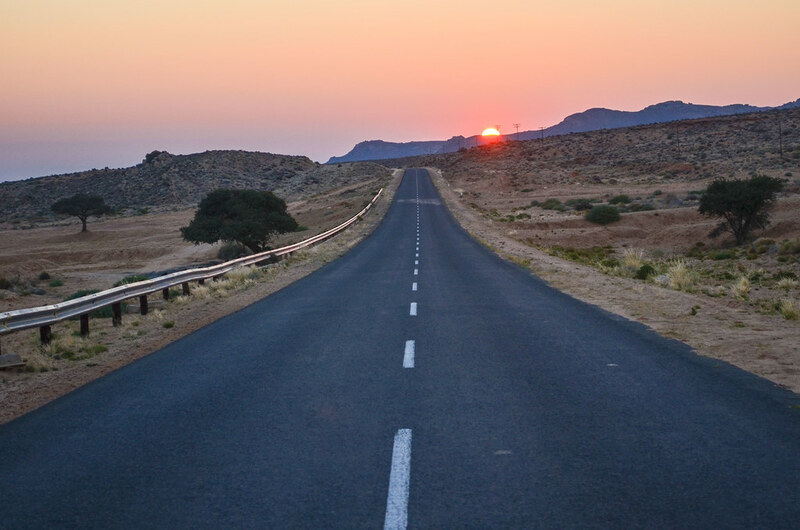 The best asset of Aus, from my point of view, is that all four roads leaving Aus are downhill. 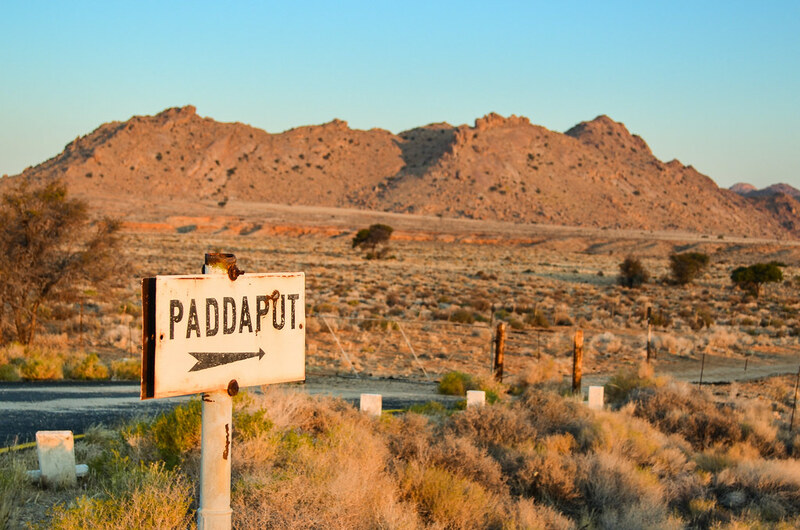 Indeed, the small town sits at an altitude of 1500 m, at the edge of the Great Escarpment. 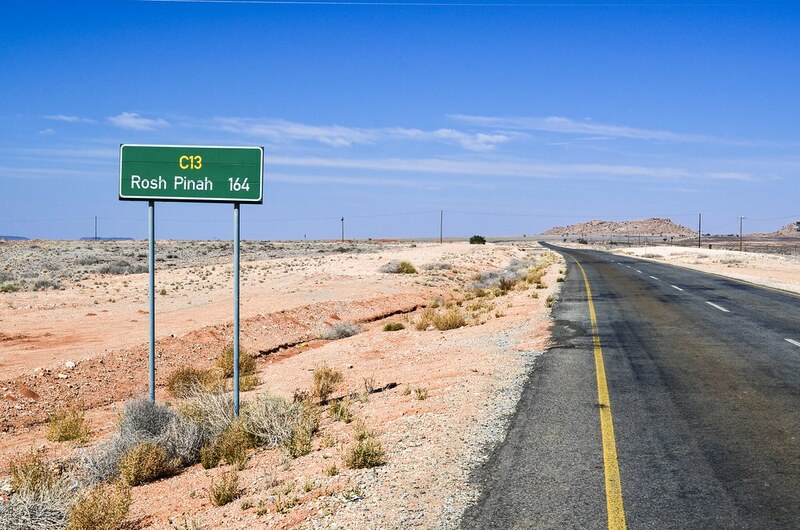 I follow the C13, a paved road heading south straight to the South African border. The 3 km leaving town uphill are then followed by a 50 km stretch, during which I barely pedal! Looking at my GPS, it seems that the slope is in average 1% downhill. 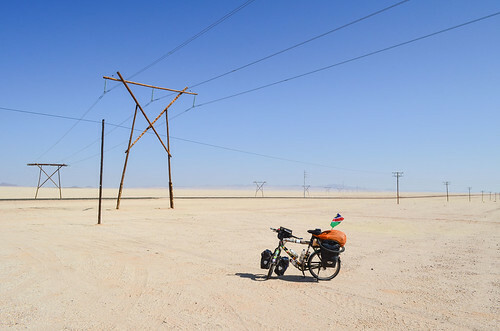 The good tar surface and the strong tailwind make it very pleasant, as I am left to enjoy the bare landscape and the ostriches without producing much effort. 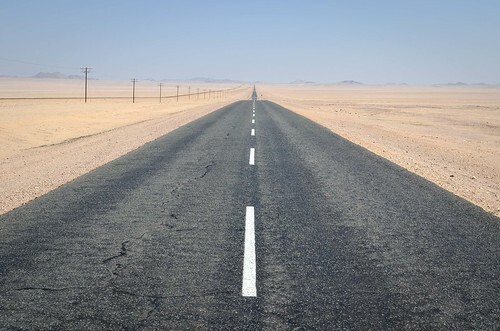 As usual, there is almost no traffic, and the mountains and plateaus surrounding me seem shaped by water and erosion. The nice blue sky makes time go by fast. I could cycle the 170 km to Rosh Pinah within the same day if I had left early. But I am taking it easy and two days will work fine, if the wind doesn’t change sides. Note to future cyclists: At the “Rosh Pinah: 90” road sign, there is a ruin by the road. 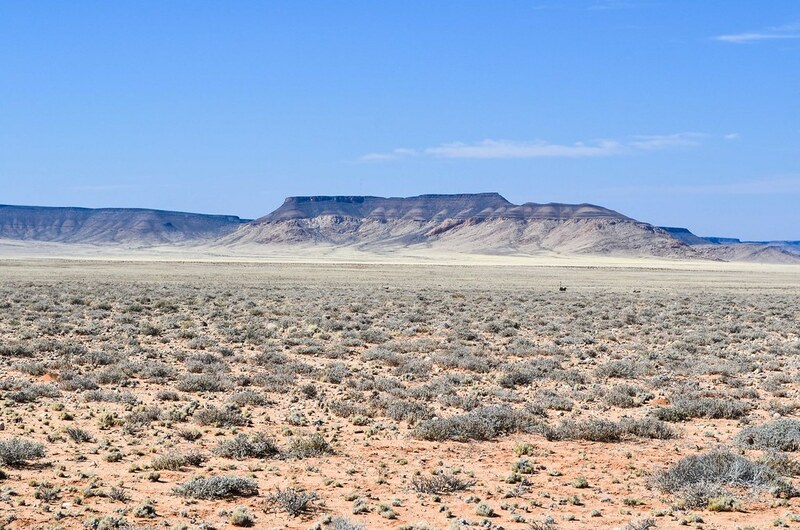 Three walls that would do to pitch my tent and remain sheltered from the wind. But it’s still early for me, so I move on. At the end of the day, I have gone 100 km away from Aus. 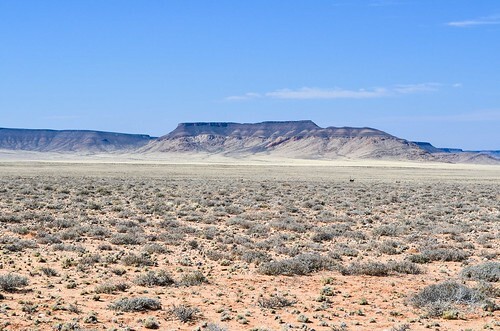 It’s a good distance, but I am still surrounded by bare landscape. 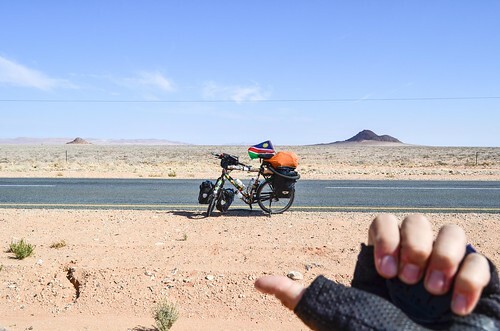 I decide to push until 120 km, remembering that Steve said there is a windmill at KM 120. If there is a windmill, there is also probably a concrete tank nearby, or even a farm, where I could sleep. 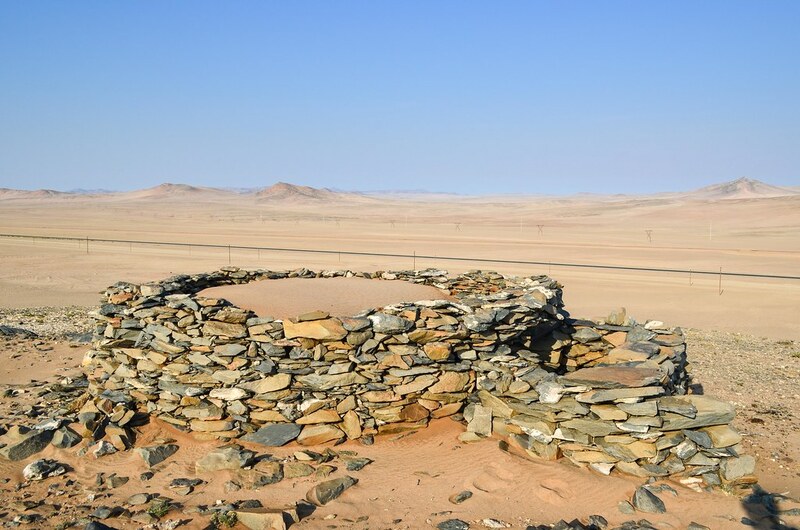 Also, one of my maps indicates “Witputz cattle post” there, at the crossroads between C13 and D463, so I am hopeful to find ruins, and set up my tent sheltered from the wind. An extra 20 km to cycle means I will get there after sunset, with very little light, and I won’t be able to look in the bush for a good camping spot. So there’d better be something there. 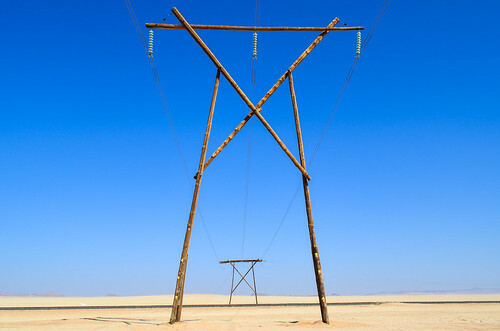 I reach Witputz (also spelled Witputs), and spot two windmills, but nothing else. It’s dark and I am not too surprised that even a bare crossroads has a name. 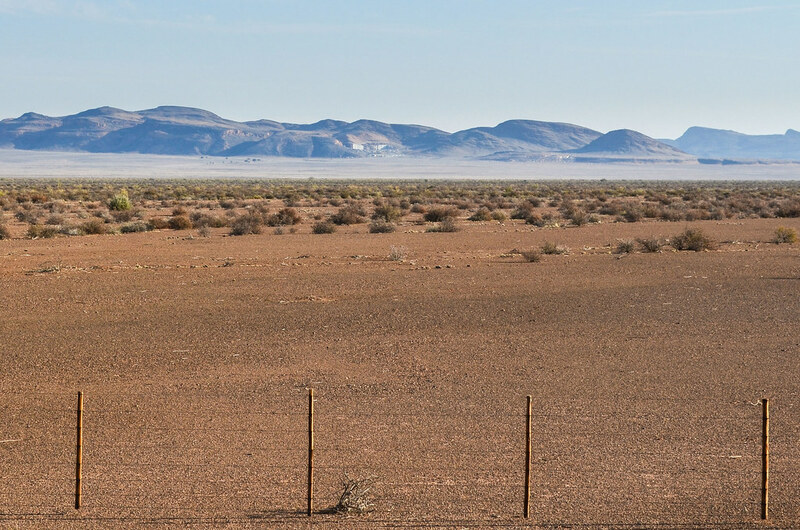 Because of the windmills, there must be animals and a farm around here, but it could be in any direction, and maybe 5 km, 10 km or 15 km away. Too risky to look for, on unmarked dirt tracks, by night. The gravel D463 is heading east, right into the Fish River canyon, and it feels like another scenic road with nothing on it for 100 km. 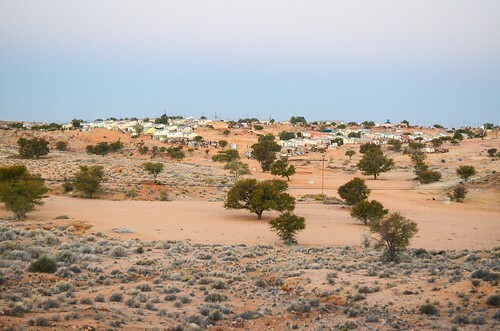 I venture on it to camp away from the C13, paved and as busy as, maybe, 50 cars a day? And then, it’s jackpot! Just a kilometer away, I discern white buildings in the dark. 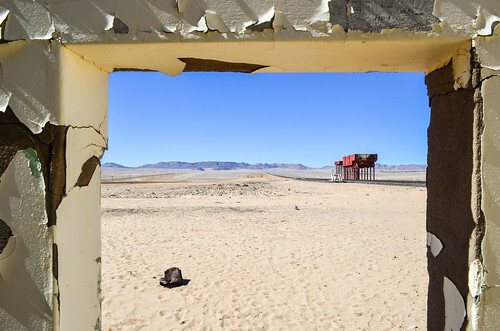 It looks like an abandoned farming complex, with many buildings. Once again, that’s my last chance at the last moment! All the buildings look nice and clean, and they are all empty. It doesn’t really look like a farm, but more like a police office or a workshop, with a car inspection pit. I have a choice of 10 rooms, and I pick the one with a door and the best viewpoint against visitors. I don’t think there is much wildlife around, but one never knows. 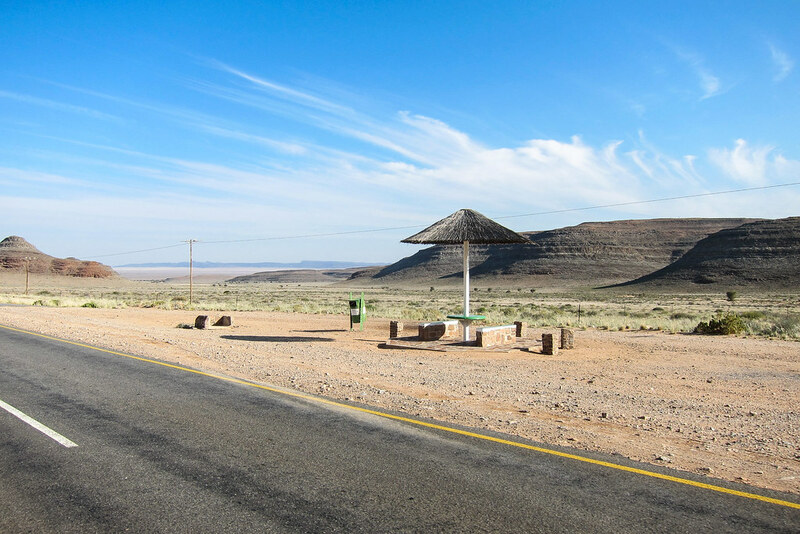 It’s a perfect stop for cyclists! (the main gate chain is so rusty it can be opened and closed with little pressure). 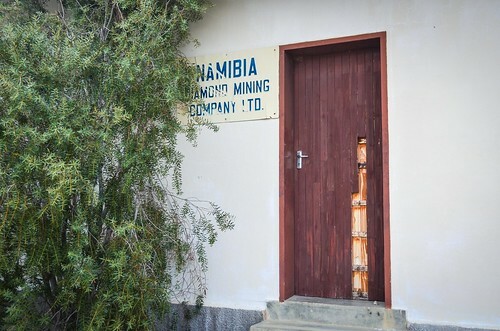 When I leave it in the morning, I see a sign that I had missed at night: Namibia Diamond Mining Company Ltd. I didn’t know there was diamond mining in the area. And I can’t find anything online that would tell me a bit more about where I slept. 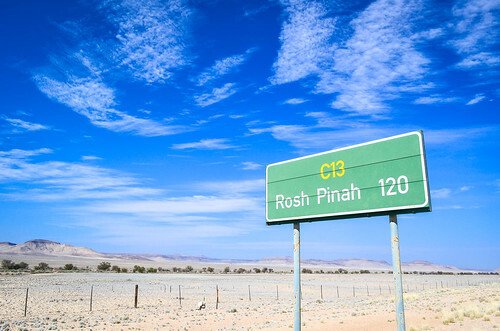 And now, just 50 km away from Rosh Pinah, I will get there early and hopefully visit the Zinc mine underground. 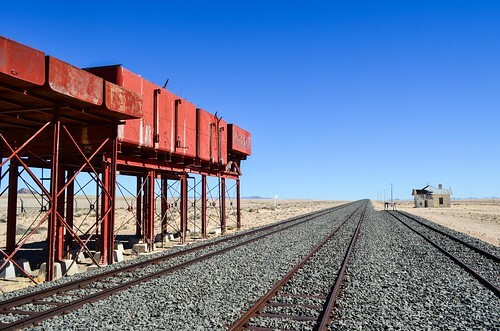 fyi, i was in Luderitz a few weeks ago, and the railway is still not operational. Everyone that I spoke with laughed at the concept that it would be running any time soon, despite numerous promises that it would go live before the end of 2016. I’ve seen your pics, at least you were lucky enough to go until Pomona! Hi JB, thank you for this very interesting series of blogs, they have been a great read … and I’ve still got many countries to go. This particular blog brings together two things I take great interest in, exploring and railways! 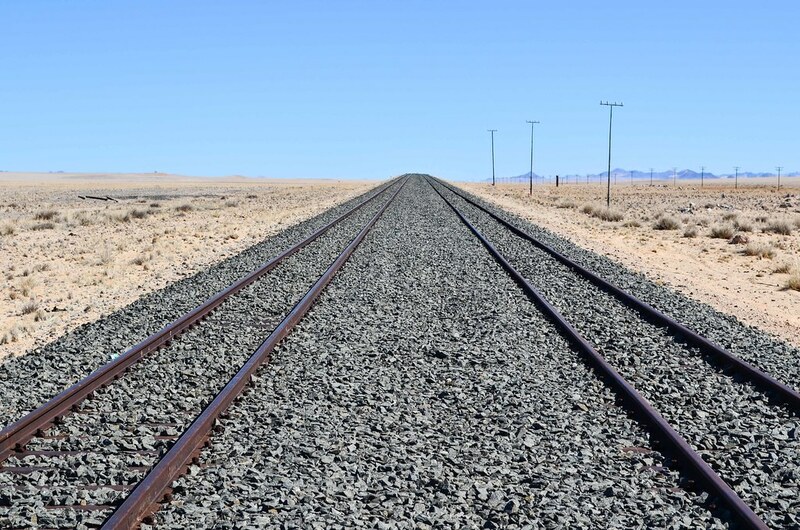 One thing to note is that this particular railway (Aus – Luderitz) is being completely rebuilt with a pre-fabricated ballast-less rail system called Tubular Track, as you saw under construction at the Luderitz end. So the work done earlier to repair the line using the traditional ballast approach, as seen in your photos around Haalenberg and Garub, will eventually be replaced by the type of rail seen in your photos at the start of this blog. 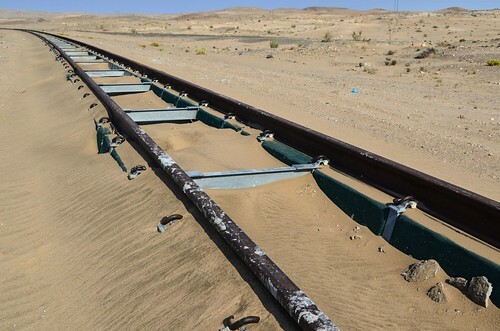 This type of rail is better suited to desert conditions as desert sand gets mixed into ballast over time and alters its reaction to loads passing over which leads to derailments. 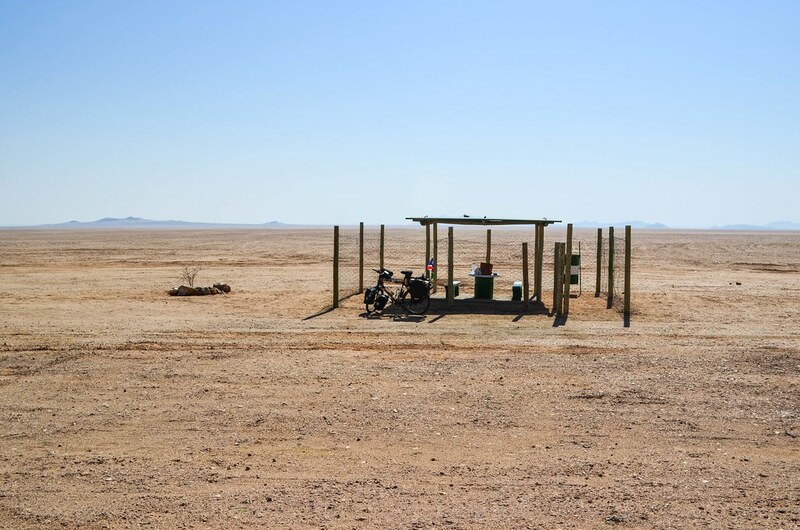 More information on the contractor’s website http://www.tubulartrack.co.za (disclaimer: I have no association with that company). 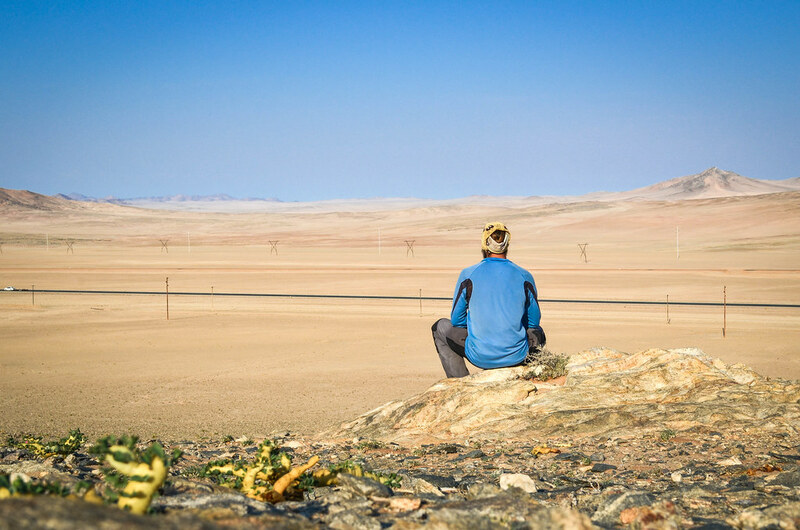 I started reading your blogs from the southern Angola section through to your return to Europe, and now I will go back to your entry into Africa – I am looking forward to reading about your experiences up north.